Nvidia is not happy with the data that Intel has presented in a recent keynote involving the company's Xeon Phi compute processors. According to Nvidia, Intel has used old benchmarking software and hardware to paint Xeon Phi in a more competitive light against Nvidia's compute hardware. 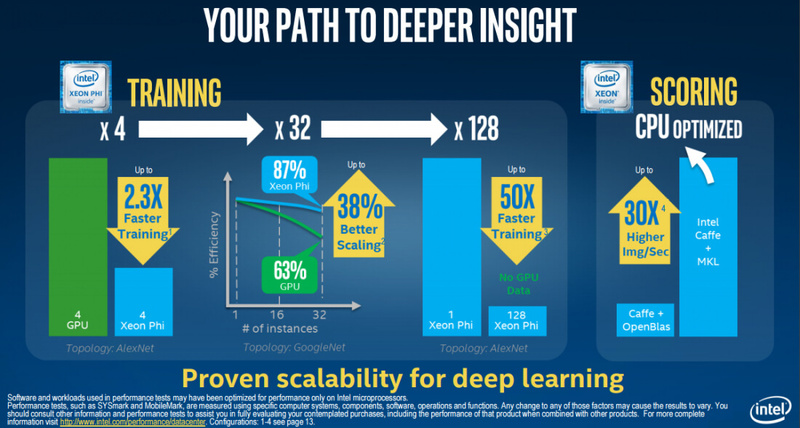 On a slide presented at ISC 2016, Intel claims that their Xeon Phi hardware is up to 2.3x faster at neural network training than a competing Nvidia GPU. Xeon Phi is also allegedly up to 38% better at scaling, according to the data and comparisons that Intel used on the above slide. Nvidia has disputed both of these claims in a recent blog post. Intel has apparently manipulated these benchmarks by using an out-of-date version of the benchmarking software Caffe AlexNet, the latest versions of which give Nvidia a 30 percent training performance advantage over Intel. Nvidia also says that Intel compared Xeon Phi to older Maxwell-based products; had they compared to modern Pascal parts, Nvidia would have a 90 percent advantage. The scalability claim is also disputed by Nvidia, with the company saying that Intel compared 32 Xeon Phi servers to 32 servers using Nvidia's four-year-old Kepler-based Tesla K20X hardware. Had Intel used Maxwell cards, which aren't even using the latest architecture, workloads would have scaled in a near-linear fashion up to 128 GPUs. It is completely understandable that Nvidia is concerned about Intel in this space. Intel routinely publishes performance claims based on publicly available solutions at the time, and we stand by our data.